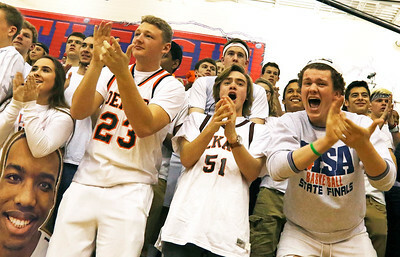 H. Rick Bamman - hbamman@shawmedia.com DeKalb fans cheer for the Barbs in the first quarter during the Class 4A South Elgin Regional final on Friday, March 4, 2016. 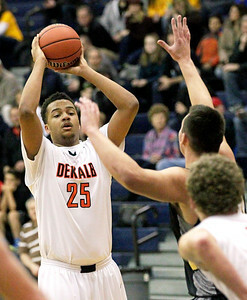 DeKalb lost to Jacobs in overtime 54-48. 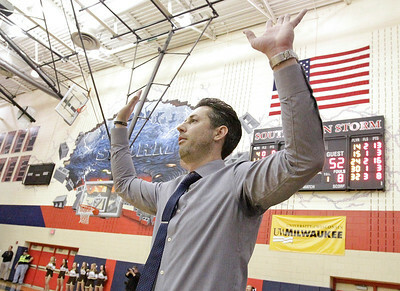 H. Rick Bamman - hbamman@shawmedia.com DeKalb head coach Al Biancalana barks instructions to his players in thier 54-48 overtime loss to Jacobs during the Class 4A South Elgin Regional final on Friday, March 4, 2016. H. Rick Bamman - hbamman@shawmedia.com DeKalb's Luke Davis works to move past Jacobs Cameron Krutwig in the second quarter during the Class 4A South Elgin Regional final on Friday, March 4, 2016. DeKalb lost on overtime 54-48. H. Rick Bamman - hbamman@shawmedia.com DeKalb forward Luke Davis looks to pass in the first half against Jacob's defenders during the Class 4A South Elgin Regional final on Friday, March 4, 2016. 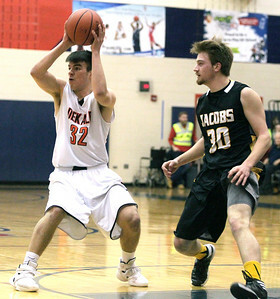 H. Rick Bamman - hbamman@shawmedia.com DeKalb's Michael Pollack, (right), regains control of the ball after Jacob's Cameron Krutwig slapped it away in the second quarter during the Class 4A South Elgin Regional final on Friday, March 4, 2016. DeKalb lost 54-48 in overtime. 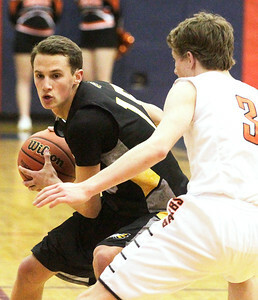 H. Rick Bamman - hbamman@shawmedia.com DeKalb's Nick Snow looks to pass as Jacobs' Timothy Randl defends in the first half during the Class 4A South Elgin Regional final on Friday, March 4, 2016. 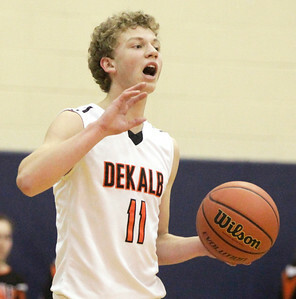 DeKalb lost 54-48 in overtime. H. Rick Bamman - hbamman@shawmedia.com DeKalb's Cole Tucker tries to find a path through Jacobs defenders Timothy Randl (30) and Kyle Ross (15) in the second quarter of the Class 4A South Elgin Regional final on Friday, March 4, 2016. DeKalb lost 54-48 in overtime. 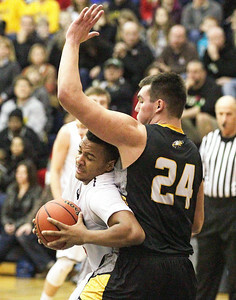 H. Rick Bamman - hbamman@shawmedia.com Jacobs Cameron Krutwig moves around DeKalbs Luke Davis in the fourth quarter. 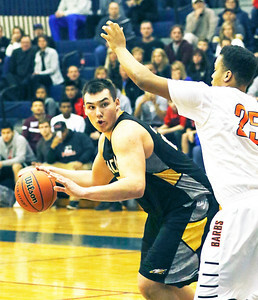 Jacobs beat DeKalb 54-48 in overtime during the overtime during the Class 4A South Elgin Regional final on Friday, March 4, 2016. H. Rick Bamman - hbamman@shawmedia.com DeKalb's Cole Tucker directs teammates to set up a play in the second quarter during the Class 4A South Elgin Regional final on Friday, March 4, 2016. 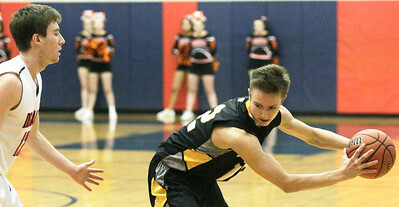 DeKalb lost to Jacobs 54-48 in overtime. 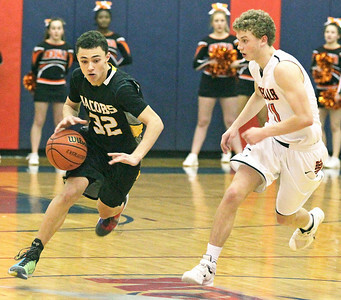 H. Rick Bamman - hbamman@shawmedia.com Jacobs Nikolas Balkcom drives up court past DeKalb's Cole Tucker in the 54-48 overtime win during the Class 4A South Elgin Regional final on Friday, March 4, 2016. H. Rick Bamman - hbamman@shawmedia.com Jacobs' Adam Kale brings the ball up court against DeKalb in the first half during the Class 4A South Elgin Regional final on Friday, March 4, 2016. Jacobs won 54-48 in overtime. H. Rick Bamman - hbamman@shawmedia.com Jacobs' Cameron Krutwig (24) looses the ball as DeKalb's Cole Tucker (11) and Luke Davis (25) defend. 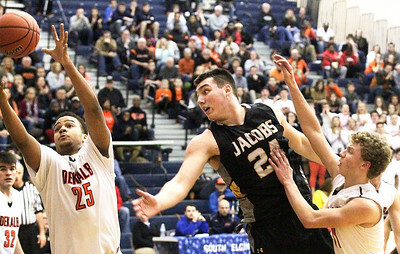 Jacobs won overtime 54-48 in the the Class 4A South Elgin Regional final on Friday, March 4, 2016. H. Rick Bamman - hbamman@shawmedia.com Jacobs' Kyle Ross works around DeKalbs Joey Sauser in the fourth quarter in the the Class 4A South Elgin Regional final on Friday, March 4, 2016. Jacobs won in overtime 54-48. 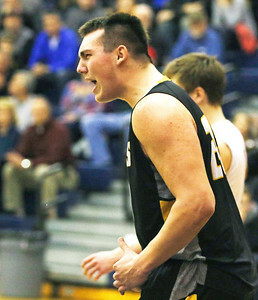 H. Rick Bamman - hbamman@shawmedia.com Jacobs Cameron Krutwig reacts to a foul in the fourth quarter. 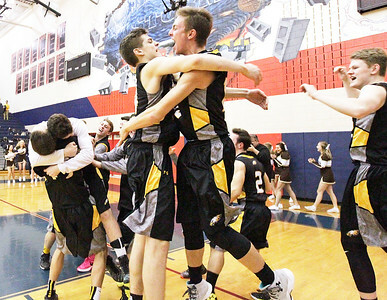 Jacobs beat DeKalb 54-48 in overtime during the overtime during the Class 4A South Elgin Regional final on Friday, March 4, 2016. 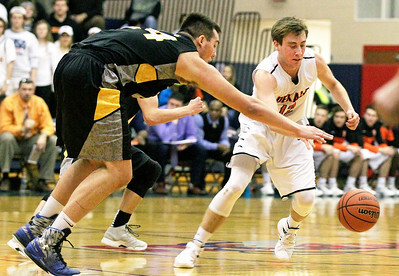 H. Rick Bamman - hbamman@shawmedia.com Jacobs' Cooper Schwartz moves past DeKalb's Michael Pollack in the fourth quarter in the Class 4A South Elgin Regional final on Friday, March 4, 2016. Jacobs won in overtime 54-48. 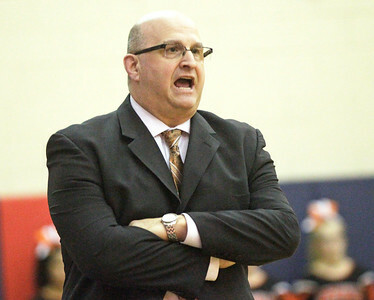 H. Rick Bamman - hbamman@shawmedia.com Jacobs head coach Jimmy Roberts reacts to a take away in the closing second of overtime against DeKalb. 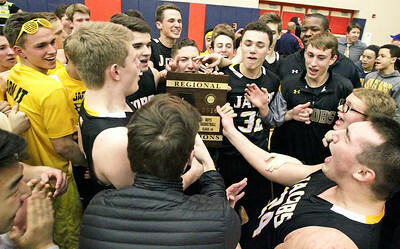 Jacobs won in overtime 54-48 in the the Class 4A South Elgin Regional final on Friday, March 4, 2016. 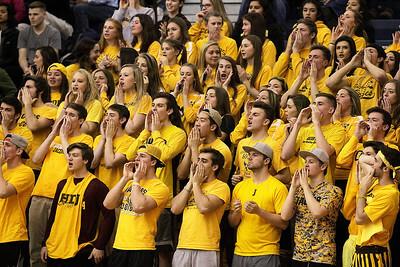 H. Rick Bamman - hbamman@shawmedia.com Jacobs fans cheer for the Golden Eagles in overtime against DeKalb during the Class 4A South Elgin Regional final on Friday, March 4, 2016. H. Rick Bamman - hbamman@shawmedia.com Jacobs players celebrate their 54-48 overtime win against DeKalb in the Class 4A South Elgin Regional final on Friday, March 4, 2016. H. Rick Bamman - hbamman@shawmedia.com Jacobs players and fans swarm the floor after the presentation of the Reqional Final plaque. 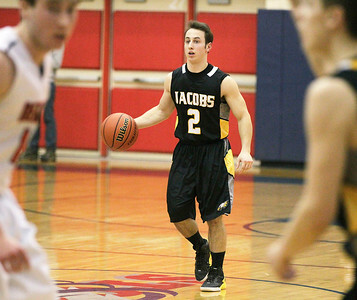 Jacobs beat DeKalb in overtime 54-48 on Friday, March 4, 2016. 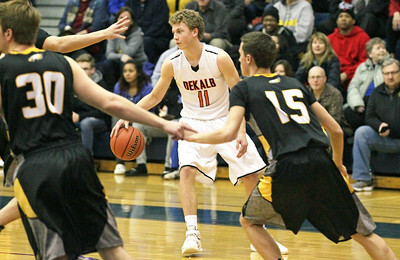 DeKalb's Cole Tucker tries to find a path through Jacobs defenders Timothy Randl (30) and Kyle Ross (15) in the second quarter of the Class 4A South Elgin Regional final on Friday, March 4, 2016. DeKalb lost 54-48 in overtime.